Photo via the Miami Inferno Facebook page. Taylor’s father, Pete, was named the head coach of the Ultimate Indoor Football League’s Miami Inferno in January for their inaugural season. The Inferno play their home games at BankUnited Center. Pete, who has been chief of police of Florida City for the last 12 years, has won his first two games so far as the leader of the Inferno. The team won its first game on the road against the Florida Tarpons 58-35 on May 16 and won its first home game convincingly 69-8 on Sunday over the Missouri Voodoo. 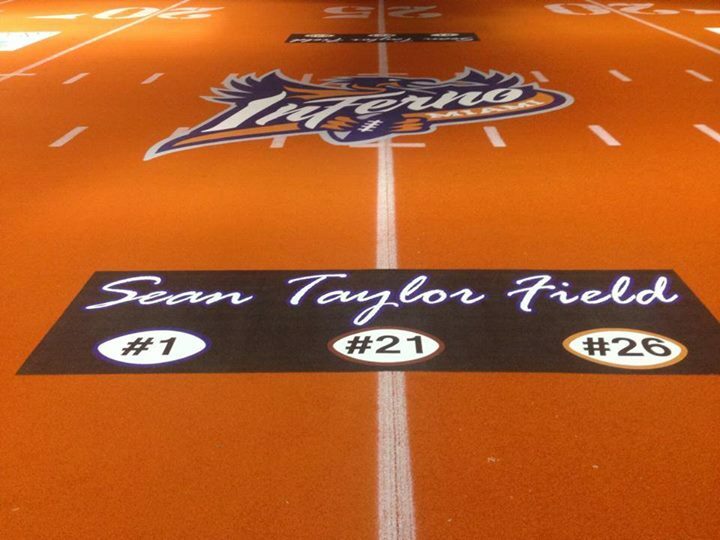 Featured prominently on both sides of midfield of the bright orange turf is “Sean Taylor Field” written above his three jersey numbers; the 1 he wore in high school at Gulliver Prep, the 21 he wore with the Redskins and the 26 he wore with the Miami Hurricanes. Photo courtesy of Simone Taylor.